Eicher Trucks & Buses, part of VE Commercial Vehicles has launched new variants for Eicher Pro 1000 series in the CNG category in a bid to further strengthen its green energy portfolio. Eicher introduced CNG in Eicher Pro 1049, which is one of its most successful products in the Light and Medium Range. Eicher also introduced another CNG variant Eicher Pro 1059 in the 5 Ton LCV category. These new additions are aimed to capture the last mile delivery segment of customers in the green corridor of the Delhi NCR region. The development is also in line with the ‘Clean Fuel Corridor’ being created by the government across the Northern belt. The brand new CNG range is powered by fuel efficient state-of-the-art E483 4 Cylinder 2 V CNG engine with long oil drain interval and ease of service and maintenance. The Eicher Pro 1049, ideal for intra city distribution applications and last mile connectivity, has had a successful run in the last two years. The Eicher Pro 1049 comes with the longest cargo body (10ft) & highest payload (2.5T) in the sub 5T segment, offering great value to the customer, with benefits of both of a pickup vehicle and a truck. Pro 1049 also has the best in class fuel tank capacity of 170 litres which translates to longer trip distances; and low wait times at CNG stations due to the smart dual fuel filling valve (Industry First) that is compatible with all CNG stations. The CNG version is the most relevant upgrade for customers and city transporters who need best in class space, payload, service interval, power and pick up with lowest maintenance - an opportunity to grow their business and increase profitability. 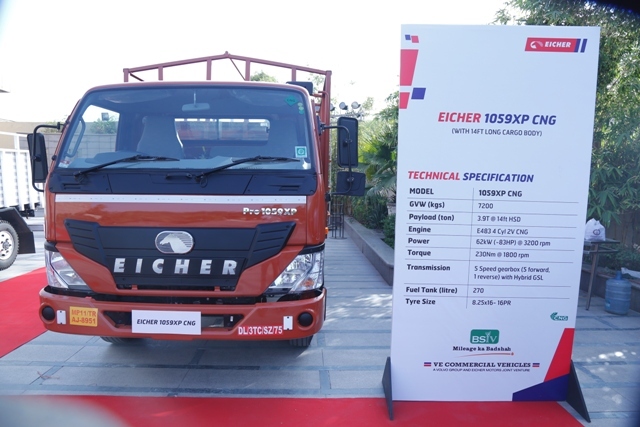 Moreover, the Eicher Pro 1059 CNG version with 12ft and 14ft cargo body lengths has been introduced to address critical city applications such as voluminous cargo. Both Pro 1049 and Pro 1059 CNG vehicles have been designed to ensure convenient and effortless loading and unloading, easy maintenance and longer service intervals, safety of goods and superior uptime. The two CNG trucks have been introduced in Delhi, Haryana and UP markets and will be available across India in various cargo body option right from 10ft to 14ft.